Did you see the June 13th, 2011, issue of Time magazine? 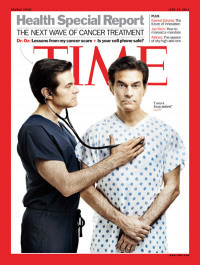 Dr. Oz says, “I was a lousy patient!” He vowed to have a colonoscopy when he turned 50, but didn’t properly prepare for it. How shocked he was when a precancerous polyp was found! Because of his poor prep, he needed another test 3 months later where a benign polyp was found in a more dangerous position. Dr. Oz is a picture of health; he eats right and exercises. All of our immune systems fight cancer every day and it is extremely important that we give the body the right nutrition every day to enable our bodies to build strong immune systems. The article talks about The Anticancer Diet. “Fruits and Veggies are packed with antioxidants that fight cell damage related to cancer.” There are no promises or guarantees; but what science reveals to us (over & over again) is that we reduce our risk of chronic disease by eating a plant-based diet rich in fruits and vegetables. Juice plus+ is the whole food nutrition of 17 fruits, veggies and grains in capsule or yummy soft chewable form. Juice Plus+ Vineyard Blend has an additional 9 grapes & berries.